The Grid is a purpose-built graduate student and young medical professional housing project targeting students attending University at Buffalo medical, nursing, and other health care related programs. The project also caters to the young medical professional seeking to live in walking distance to the Buffalo Niagara Medical Campus comprised of numerous hospitals, clinics, and laboratories and home to thousands of professional jobs. This project is primarily studio and one bedroom units with an incredible roof-top terrace with unimpeded views of downtown Buffalo. Rails on Main is a purpose built student housing project targeting Graduate students attending University at Buffalo. This project involves brownfield remediation, renovating existing buildings, and new construction. We are also introducing micro units to the Buffalo market through this project. The Point on Flamingo is an existing apartment community comprised of nearly 200 units that shares 2 property lines with UNLV. The property was being operated as multi family when Blackfish purchased the asset. The property is being repositioned as premium student housing in a truly Fortress location. The Lodges at Glenwood was a purpose built student housing project built in 1976 targeting undergraduate students attending Brigham Young University. The Project involved substantial renovation in 2005, renovating existing buildings facades and roofing systems, adding central heating and AC in each unit, as well as up-dating interior finishes and FF&E. Raintree Commons was a purpose built student housing project built in 1978 targeting undergraduate students attending Brigham Young University. The Project involved substantial renovation in 2004, renovating existing buildings facades, as well as up-dating interior finishes and FF&E. Cambridge Court is a purpose built student housing project targeting Graduate students attending Brigham Young University. Project involved new construction in 1992 of what at the time was considered an innovative micro unit design introduced to the Provo market through this project. It was the first of it’s kind and has proven to be highly successful. 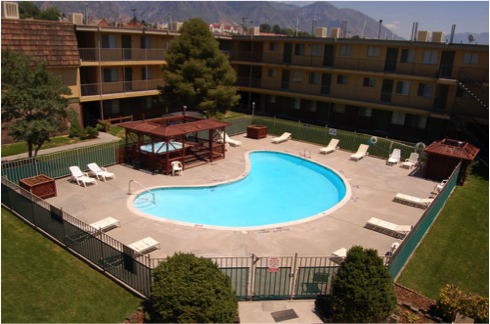 Riviera Apartments is a purpose built student housing project targeting undergraduate students attending Brigham Young University. Riviera was a high performing asset, sold in 2005 after 17-years of ownership. University Villa was a substantial renovation inside and out. The transformation of the property propelled it to higher occupancy and strong rent growth providing strong returns to investors. Sold in 2005. The Retreat was designed as a pedestrian mixed use project proximate to Arizona State University. Explosive enrollment growth at ASU and high rental rates made this a compelling opportunity that was acquired by Campus Crest in 2011. The Retreat @ Plumb was designed in a fortress location adjacent to Colorado State. Campus Crest purchased this project as part of a portfolio transaction in 2011. Ritz Classic was an urban infill transit oriented development in Salt Lake City near University of Utah. Although not specifically designed as student housing, Ritz Classic was designed to appeal to this demographic group. A Blackfish partner, Mr. Earl, acquired, designed, and entitled the project on behalf of Weidner Apartment Homes.